Geldof wants to recreate Dunkirk as part of a "continental adventure"
Bob Geldof is calling on boat owners to sail en masse across the Channel to bring back more marchers for an anti-poverty walk to Edinburgh. 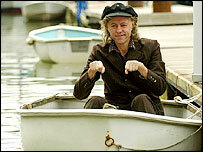 Geldof launched "Sail 8" at Swanwick Marina, Hampshire, on Monday. The launch coincides with more than 150,000 tickets going up for grabs for the Live 8 gig, to be held on 2 July. In the days after the concert, Geldof wants people to march to Edinburgh in time for a meeting of the world's richest G8 countries in Gleneagles. At the same time, he wants boat owners along the south coast to sail across the Channel to collect more demonstrators for the march, which he is calling "The Long Walk to Justice". The campaigner hopes as many as 1m people will descend on Edinburgh by 6 July for a "party" to persuade world leaders to address poverty issues. He told BBC News he wanted Sail 8 to recreate Dunkirk as part of a "continental adventure", and urged people to sail across the channel to pick up their "French cousins", so they could join in the demonstrations. "All those willing people from the southern ports of Britain, really the only thing they can do is hop on their boat and get over to France," he said. "It's their commitment, it's their way of doing the long walk to justice. "It will be many hours of sailing and it will be picking up some people they may not even be able to communicate with but the symbolism of that around the world will be one of great effort, great friendship, great solidarity." Earlier, a spokeswoman for Geldof said record-breaking British yachtswoman Dame Ellen MacArthur supported the event. "We are asking people to come across the Channel and to set sail in such a way that it's showing some support. It may be they only get as far as Portsmouth," the spokeswoman said. "Bob's always said this is about a global movement to get people to show their support, whether or not people go the full distance." A lottery for Live 8 tickets, to be held in Hyde Park, London, began on Monday. The concert, part of the Make Poverty History campaign, is one of five gigs being held around the world on 2 July to raise the issue of poverty. On the same day as the Hyde Park gig there will be concerts in Philadelphia, Paris, Berlin and Rome.